As a provider of CAD/CAM special solutions and long-time software and technology partners of PTC, Software Factory has developed Creo-specific extensions and applications for over 20 years. Our mission is to adapt Creo to the specific needs of your company and to best integrate it into your process chain. We help you to optimize your Creo installation from a technical viewpoint and with regard to better cost efficiency. SF SIMPLIFY for PTC Creo is the easy-to-use and fully automated tool to generate a filled envelope geometry to simplify complex models or to deface their inner details. Use SF COLORCODING and be able to use colors for the fully-automated assignment of quality specifications directly in your CAD model. SF COLORCODING saves your valuable time by removing manual tolerance assignments in separate 2D drawings. GEOCHECK for Creo is the module for testing and controlling the data quality of CAD models according to the VDA Recommendation 4955/1 of the Association of the German Automotive Industry (VDA). Every company defines specific standards and design guidelines for its assemblies, parts and drawings. QCHECK for Creo checks the compliance with these specifications in the design process. As a consequence it ensures CAD data quality and compatibility with the subsequent process chain. THERMCUT for Creo extracts the silhouette geometry required for NC cutting and various other data relevant for production directly from 3D sheet metal models. The resulting Dxf or Iges files are ready for use in nesting programs without manual modification. Thus, a high degree of automation can be achieved, leading to considerable time savings. eTRONIC for Creo is equipped with interfaces for different circuit board layout systems. The development of eTRONIC is based on the Pro/DEVELOP programming interface. The free of charge Creo add-on helps you by correcting entire modules. The tool detects hidden dimensions and product information in 3D parts and allows an automated correction at the push of a button. ISOTOL for Creo is an auxiliary application for the Creo drawing mode and generates ISO tolerance tables without fussing about ISO. The application looks for ISO tolerances in Creo drafts, which will be listed subsequently in a table. 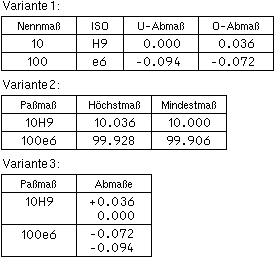 Three different types of ISO tolerance tables (fig.1-3) are available. GEN2PRT for Creo is a module for automatically disjointing family tables. At the push of a button all instances of a family table can be exported to a configurable directory as independent Creo parts. GEN2PRT can be run in part mode on single- and multi-level family tables. PARAM for Creo is a module for the simplified and standardized handling of user-defined parameters. It has been developed using the J-Link API that is integrated into Creo. PARAM for Creo can be applied in part-, assembly- and drawing mode. It supports you in ensuring a unified placing of parameter values throughout your company. Via configuration files, a set of predefined values can be defined for each parameter. For each parameter you can define also if only the predefined values are valid or if a free user input is allowed. Furthermore, each parameter can be defined as required (i.e. it needs to be defined in each model) or as optional. Since parameter names are sometimes “cryptic”, a help text for each parameter can be defined. All configurations can be specified separately for each mode, i.e. for the part-, assembly- and drawing-mode. Industry 4.0 needs new capabilities and methods to improve the workflows within the product development process. 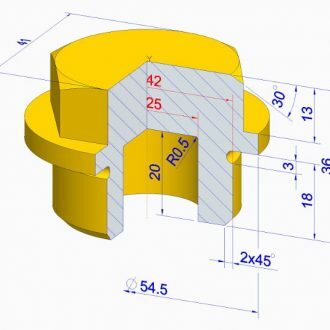 Smart Engineering and the complete digital definition of the product model require an economical and beneficial optimization of CAD-CAM processes with Model Based Definition (MBD), Model Based Enterprise (MBE), and Product Manufacturing Information (PMI). With the help of Software Factory, you can work more efficiently and productively with the Creo and Windchill platforms. With 25 years experience as a PTC Software Partner, we have the expertise to automate your product design with Creo Toolkit, making it more flexible, faster and more efficient. Smart engineering, agile development methods and the complete digital definition of the product model enable a new user experience across the entire product life cycle with augmented and mixed reality. This offers companies from various industries and their customers fantastic new opportunities, from smart engineering through smart manufacturing to smart service and assistance.